I work with absolutely the best social worker ever! I get to work with her several days a week with our social language groups. These groups are so fun! They consist of students with ASD who are in self-contained rooms. We bring in peers from the general education rooms to help us elicit more speech, work on social skills, and to be play models. With the population of students that we have this year, we have 11 students who have either a PECS (Picture Exchange Communication System) book or a high tech device to communicate. We have been working really hard on getting students to use their books, and to communicate with a variety of communication partners. Our students are in all phases of PECS from Phase II where they learn to travel, to Phase V where they are learning about using attributes in their sentences. We are really lucky to be able to run these groups the way we do, because one of us is always able to act as a prompter when needed. Our main problem with these groups was that we were not totally organized with implementing the use of PECS. We had pictures for most things in the room, but we would often lose them, or leave them in a student's book and forget to make new ones. Over a recent break, the social worker that I work with revamped the space we work in to make data collection, and the whole PECS process a lot easier for us. She did an amazing job, and agreed to let me show and tell you about it! Organization is not totally my strong suit. I am more of an organized chaos kind of girl. Thank goodness that my partner has strong organization skills! First, she made a clipboard for each student. We then printed cover sheets with each student's name. On the clipboard is their data for PECS. We use the forms provided in the PECS manual cd for collecting our data. She also organized all of these PECS data sheets into files so that we can quickly grab any data sheet that we need. See all of those boxes under our data sheets? Those are chock full of small reinforcing items. We printed lots of pictures for these items and try to always keep on picture of each item on the top of the box so that students can easily grab them. If a student really likes a particular item, and requests it several times, we will just keep a copy of that picture in their personal PECS book. Speaking of all of the extra pictures, check out this great binder that we use to keep all of our extras. In addition to the boxes that have reinforcing items, we also have a variety of larger toys, puzzles, and games. A lot of our toys and games are things that I may or may not have stolen from my own boys. A girl has to be resourceful! Food is a great motivator for our students, so we have started allowing a little snack time at the beginning of our PECS lesson sessions. We have a snack area that is filled with all of those really bad things for you that the kids will absolutely exchange a picture/icon for. We have chips, candy, pepperoni (one little guy's favorite), and of course Goldfish crackers. We are very aware of items that we put into the bin, because we have students with peanut allergies. When we have students with gluten free or other special diets, we usually ask the parents for some extra snacks to use with their child, so nobody is left out. We also now have colored cups and bowls so that we can work on attributes. We also work on attributes with candy and goldfish (who knew there were so many kinds), but sometimes a bowl works better because you can put any treat in it, and offer that bowl plus another colored bowl that is empty. I know which one I would want! Here is a picture of our snack table. On the table, you can see some colored bowls, snacks, reinforcer boxes, a student's PECS book, and a topic board. The topic board has all of the icons needed during snack time. Students can use pictures from the board or their own books. If a student is in an earlier phase, we will select the pictures for them and place them on the front of their book. We have been having a great time using our newly organized space! Our students have already made nice progress with their PECS phases. I'll keep you updated on how it is going! Great post! I just started PECS for the first time this year with a preschooler and we are having pretty good success with it, but as I don't have much experience with it, I'm always looking for new ideas! Thanks! I'm so glad you can use the ideas. Great post! I am envious of your organization! Thanks Jenna! Unfortunately, I can't take credit for the organization- it is mostly my awesome school social worker who has the organization skills. The organization of everything has really helped with our data collection and availability of pictures! This is amazing! I also co-teach a group with my school's behavior specialist. We have such fun on Thursday mornings. I can't wait to use some of these organizational ideas. Thanks for sharing. How fun that you get to co-teach a similar group! Hope the ideas help! Oh my gosh, that is an organizational dream! 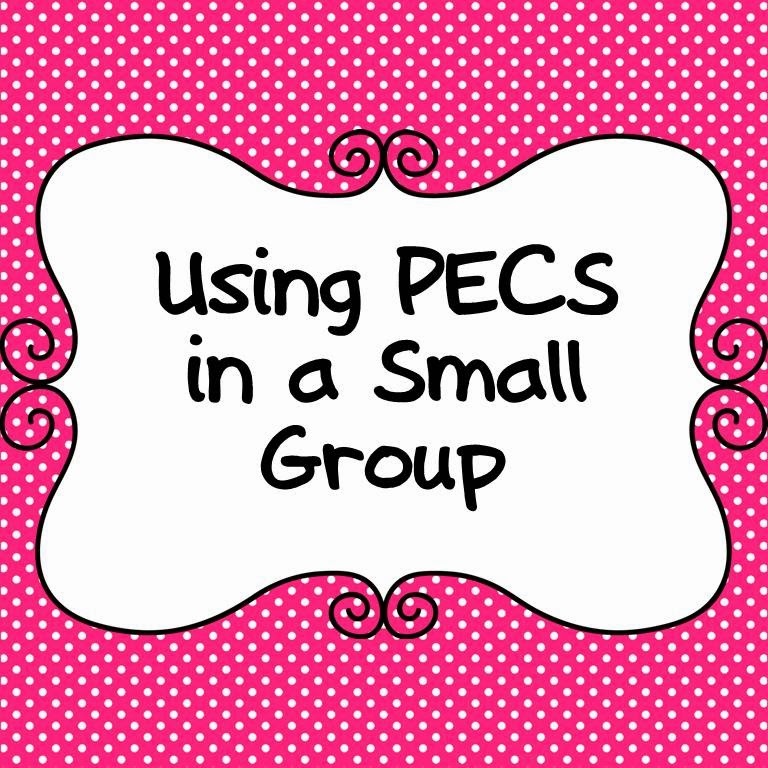 I don't have any students that are currently using PECS, but I am saving this post for when I do! !